Wheels retract until they're needed. Rugged. Lockable. Designed to last. Nothing to unfold. Nothing to position. These common sense workstations don't require minutes to set up or close up. As a matter of fact, they don't require any time or effort at all. Simply open the doors to get down to business. When work is done, just shove the chair in and shut the doors. 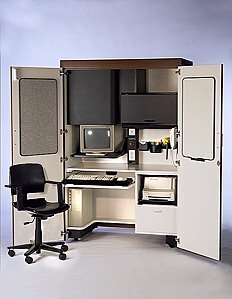 This workstation is designed for people who need a real place to work. That's why it's called The OFFICE. 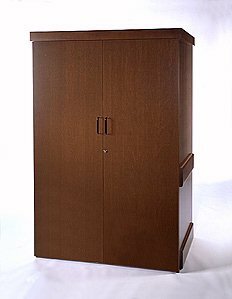 The OFFICE Manager and Manager-LT models, shown above, are both 48" wide, 28" deep, and 72" tall. 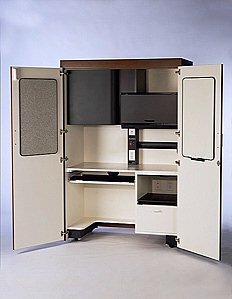 The LT model (for LapTops) has adjustable over-desk shelving in lieu of the electric monitor lift. 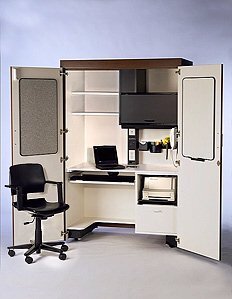 These compact, wired, mobile, lockable, models of The OFFICE allow you to close the chair up inside. No tangle of wires protrude from the back of The OFFICE because wiring is internal. They have been carefully engineered so that only a single 110v electrical outlet and a phone jack are all that's needed for full operation. That allows you to site it wherever it's convenient. Go ahead....install your Complete Computer System, Printer, Fax or Scanner, or your combination print/fax/scan/copy combination unit, PLUS up to 4 additional electrically operated accessory items.